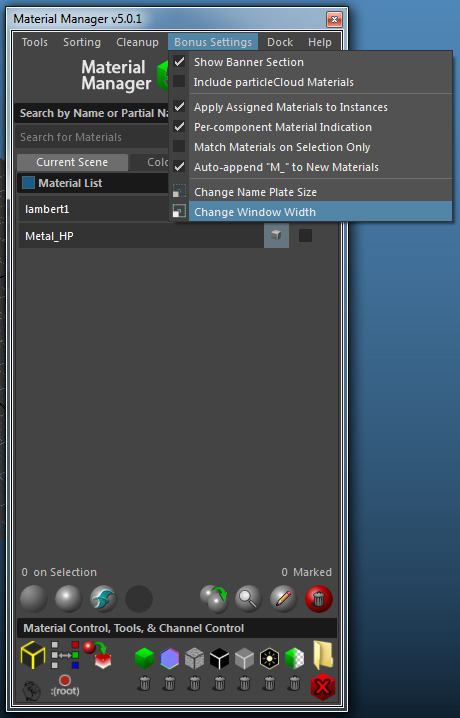 [Maya] Material Manager 5.0.0 has Arrived! 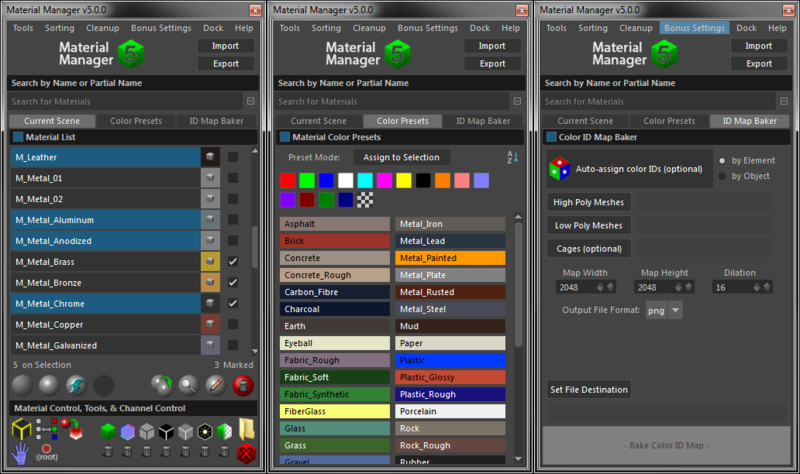 Hey guys, just wanted to do a quick plug of the latest and final edition of my Material Manager tool for Maya. Any feedback is welcomed, and I'll keep an eye on this thread for bug reports. Thanks! 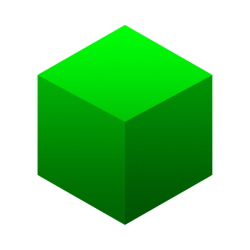 Material Manager 5 has arrived! 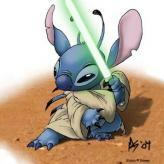 This version comes with another massive overhaul to all the code. The information flow should be much more clear and easy to read, and much of the functionality should be more compartmentalized for easier modification, if you’re into that sort of thing. This overhaul marks the 5th time I’ve rewritten/reorganized the code which is why i’ve decided to make this release 5.0 instead of 4.4… and because it’s so much better! UI in general has been overhauled. Nearly all of the UI has transitioned from a gridLayout format to a formLayout format. Replaced Quick Checker material with a Quick StingrayPBS material. Quick Checker has now been appended to the end of the preset swatches. Duplicate Material has been overhauled. 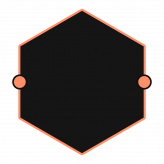 Hypershade is no longer required to be open and all shadingEngine and down stream nodes will automatically rename according to the new name. Many functions that deal with material channels are now smarter and will attempt to pick the most relevant channel if one exists. This also means that materials not necessarily listed as being supported here may still work and/or it will be very simple to implement support. ID Map Baker now remembers the most recent meshes you loaded as well as the file destination. The Smart Exporter has been removed from being part of the Material Manager. Development will be conducted separately from now on, however it is currently backlogged. Great news! 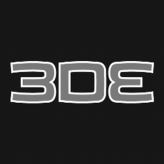 I've been using Ddo manager script and now it just got better! Tks a lot! Just tried this for the first time, great work! Thanks for the awesome script Bartalon! everything works great. I can't seem to bake the color ID map from the high to low poly following the steps in your video. I'm using the Maya 2014 on OSx. No matter which file format or file size I select, I get the same error about iff file. Were you using a cage with your bake? Were you able to pick a file location without any errors? Did the file path, name, and format show up properly in the text field after picking it? Was the bake able to start at all, or did the error happen as soon as you clicked the bake button? Did you try picking a new file path after the first time (before baking) to see if the bake succeeds? If you have any other versions of Maya (2013 or newer), does the problem persist there as well? I didn't use a cage. I could pick the file location without error. File name, path and format all seem fine in the text field. The bake seems to start and complete without issue (i can see the progress bar at the bottom of the screen) and then displays a message saying Success color ID map baked successfully. I've tried picking different save locations. I also tried it on my home computer (also osX) using Maya 2015, and encountered the same error. ie. file is not created. I'll try looking at it again later tonight. Maybe i'm following one of your steps incorrectly. Hey Dennis many thanks for the great upgrade to your tool ! As many others I was still using your old dDo Material manager plugin, but this new update/upgrade looks awesome (I haven't had the change to use it yet, I just installed it and watched the Breakdown video). EDIT: The new Smart Exporter is really great ! 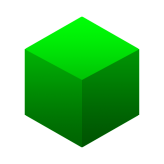 Recently I have been looking for a new fbx exporter (I am still using an old one not updated anymore, but it's quite basic). Your exporter has some nice features that will make the whole export process much faster and precise ! I also really like the new tool icon and because the default shelf icon is not the same one I quickly managed to make one taking it from the banner.png file: it works well on my shelf and I thought that maybe other people may like it (you can find it below). 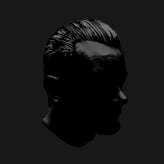 If you like it feel free to include it in future releases as additional icon. Btw keep up the good work and thanks again for your hard work. @quatic it's working just fine on my end. Can you provide any screen shots or error messages so I can look into this? 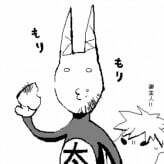 "line 1953: setAttr: No object matches name: Brick.color". I found that in line 1951 of the code material take a suffix to its name. I delete + ''_SG" and all works. @Vit Hmm, that's strange! It should definitely work without any code modifications. Can you tell me which version of MM4 you are using, which version of Maya you are using, operating system, and whether this issue persists in an empty scene? Sure! I'm using windows 10, maya 2016 ext2. I don't have any other version of this script in my maya script folder. Great, thanks for the info! I'll get this fixed up in the next update. Glad to hear your code tweak works for the time being. Oh, I do nothing Thank you for this really good script! I just got the last update (I probably missed the one from early September): you did a lot fixes and improvement: many thanks ! Hey everyone, just a quick update to let you know MM v4.3.0 is out! I spent some time fixing up the Color ID Baker and Smart Exporter among other things. You can read the Version History in the original post above to learn about what's new. Download link is up there as well. In addition to a lot of bug fixes, I've added a new tool which lets you use the marking system to duplicate materials along with their full upstream and downstream connections. The button for this tool is nestled right between the refresh and search buttons, as seen below. I have an odd issue regarding baking ID maps. I can't seem to get it to work and I am sure I have followed the steps in the video. I have added and high, low and cage mesh. Entered a valid file path and auto-assigned colour IDs to my high poly model. I'm using Maya 2016 SP6 Student on a Windows7 system. I have also tried it in Maya 2017 (I now realise this version isn't supported). That's a new one! Is it possible you have instances or identical names nested in different groups in your high/low poly selection? If possible could you send me your file so I can investigate? Thanks, I'll get right on this and let you know when I figure something out! Alright I think I got a fix in, definitely no user error on your end! Go ahead and grab the latest version. Awesome thank you so much for response and rapid solution. Confirm fix works here too. I did try and drop you some cash via gumroad to help support further development but since I had already downloaded the plugin for $0 a while back I could not pay for something I have already "purchased". Do you have a PayPal account I could use to send a small payment to you for your efforts? I have stumbled upon an issue however which you might be able to help with. Basically some of my material names are ending up quite long due to naming conventions etc. 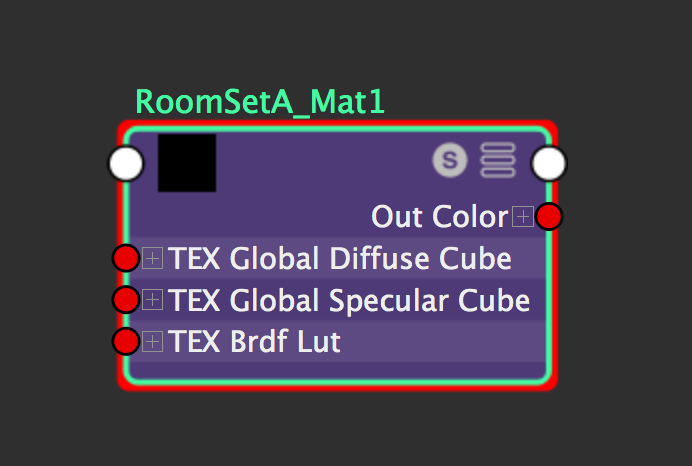 Would it be possible to add the ability to expand the material name field in the window to enable me to view longer material names? 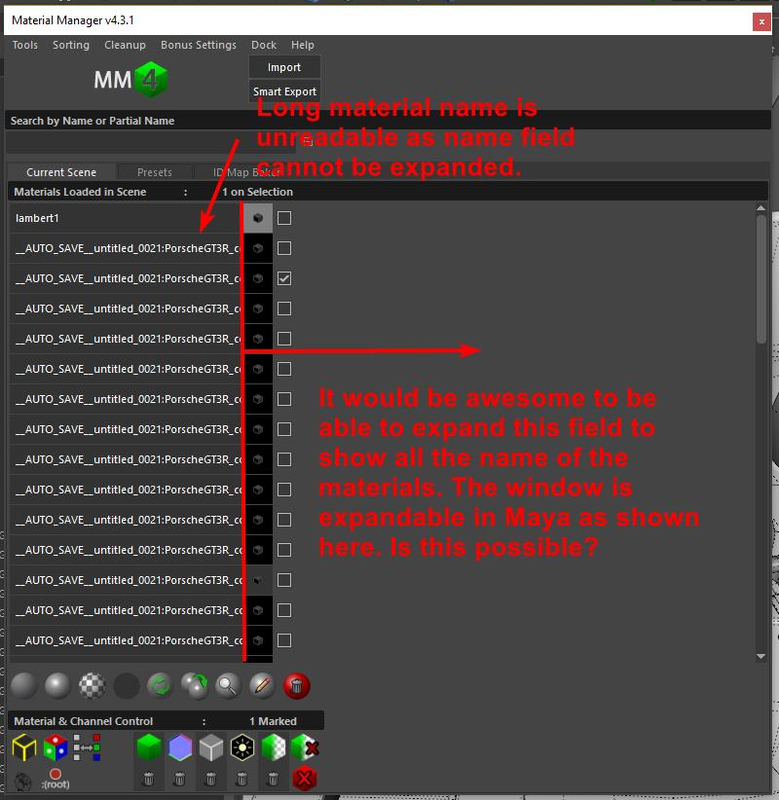 I have attached an extreme example which is a test scene maya renamed everything after a crash! Glad to hear the tool is proving useful for you! Changing the width of the window is not supported in the current version of Material Manager. In this specific and extreme example, you can use the namespace removal tool to shorten the material names to better fit the window. In the meantime, you'll be happy to hear that I'm in the process of working on the next version which does include window width adjustment along with ranged toggling of markers, multi-string search filtering, wider support of materials including StingrayPBS, preset color swatches, the ability to easily and permanently include your own basic material presets, and many more things. Hi Bartalon, thx for the great tool! I think it should be possible to adapt this for duplication. Thanks for the input! I've been aware of the bugs present in 4.X including this one. 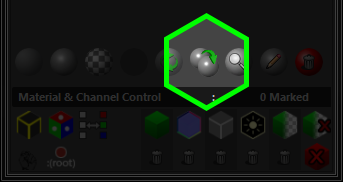 The Duplicate Material tool has been completely rewritten, along with literally everything else. I'm making sure that everything properly duplicates and all connected file and placeTexture2D nodes are appropriately renamed according to the name of the duplicated material. I'll take a look at the code you've provided and see if it can help. Thanks! P.S. To everyone - still no ETA but I am about 98% complete with rewriting all the code. I just have to do some testing and then record a video to cover all the new features. Soon! P.P.S. If anyone is interested in helping me bug test the new version please send me a private message. That's great new Dennis ! I can't wait to give it a shot. Thanks for taking the time to develop and improving this plugin: I am so used to it that I cannot imagine to go back using the Maya hypershade. Congrats on v5 release. I've only spent 15 minutes with the latest version but am not seeing the adjustable width feature. Did this make it into the release build? Sadly I am still having to deal with long material names especially from outsourcers ! The window width feature should be under the Bonus Settings menu. Make sure the title bar of the Material Manager window is showing the correct version (latest is 5.0.1 presently). Ahhhhhh Nice one Bartalon. In my defence I was very busy yesterday and didn't pay enough attention Thanks for confirmation. 1. A fatal error occurs when closing MM after I changing the window width using the Bonus Settings. I have tested various widths including the maximum and various in-between the stated values and error occurs. Also, changing the default value in mm_config.txt has no effect after restarting Maya. 2. Ctrl + Click nameplate to select polys assigned is not working. 3. When Ctrl + Click a nameplate the material list scrolls back to the top - I don't think this happened in previous versions. 4. When Ctrl + Click to skip naming of Create and/or assign materials with poly selection - the new material does not get assigned to selected faces. I am using 2017 Update5 - maybe this is the reason I am seeing the above issues? 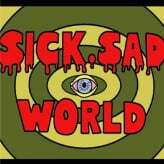 Thanks again sadpunk. I'll look into these issues soon and let you know when I get them resolved. @sadpunk I have fixed a number of the things you discovered and then some. Pick up the latest version (linked in original post)! Ctrl + Clicking a material nameplate in the Material List should now once again act as a quick “match material” shortcut. 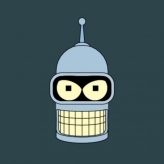 Awesome Bartalon - confirm those issues I was seeing are resolved in 5.0.3. I have version 5.0.3 and I got this message every time I select an object. Hey @triton thanks for bringing this up. That has to do with the Arnold plugin. 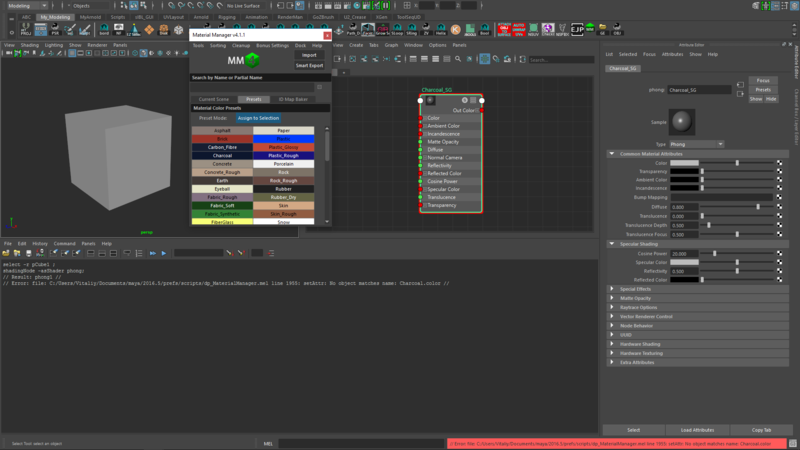 It's possible there are some material types that only exist for certain versions of Maya (as with shaderFXPlugin.mll). What version of Maya are you using? This warning should not interfere with the behavior of Material Manager, so you can ignore "unknown object type" warnings until they get patched out in the next update. But still definitely report it you find any other types that produce a warning! I really loved your tool. Is there any way of assigning a random [selected] materials for selected objects? Let's say I have 8 shaders and I want to assign them to the selected 100 objects I have in the scene randomly, Is there anyway of doing this? @bitinn looks like it's actually just a single error. The first one is an unterminated string error which will cause a flood of other errors afterward. I guess OSX doesn't like the way I've written that particular command. Can you tell me which version of Maya you are using also? I will get you something to test with within the next day. Latest version is out now, which fixes a couple of specific errors. Thanks everyone for the bug reports! Material Manager should now be reporting the proper version and release date again. Just wanted to tell that when download from Gumroad the zip file named: Material Manager v5.0.4 which make it a little bit confusing. Yes this was noticed shortly after release of 5.0.4 (whoops!). This has been fixed in 5.0.5 and now displays the proper version again You can view the Version Information under the MM5 Help menu to see what's been fixed in the latest versions, as well as what has been planned to be fixed in upcoming versions. Love this tool - saves me a lot of hassle. But (you knew there had to be one): I have trouble with v.5 up to 5.0.5. When duplicating materials it assigns the new one to the object... but somehow the old one stays stuck on it. So then I have two materials on it apparently... but not really on any polygon. Not exactly sure what it is - even reassigning via the normal Material Editor fixes it. The only thing I can do is opening the "Input Output Connections" graph, and delete the wrong material there. Also, currently the update of the list is very slow. I mean... I have a terrible file with hundreds of materials, so It's kinda my fault... but it makes it hard to work with and I have to temporarily turn MM off. Before at v4 it wouldn't have that problem (though there it wouldn't always update the list on changes). It might be because of this new warning that pops up a lot: "// Warning: file: .../scripts/dp_MaterialManager.mel line 3356: Unknown object type: aiShadowCatcher // "
And as I'm at it: Is there a reason why there isn't a "quick phong material" button? There are for Lambert and Blinn... but everything else seems to be made for Phong materials. What's the reason - am I missing something? Edit: And yeah, something is iffy with Gumroad. The text shows the current version... but the files are still 5.0.4 right now. Before it was even older. Thanks for the feedback @ThomasVeil ! Sorry to hear you are having trouble with the new version. I will look into these issues and try to find ways to optimize when/how the Material List updates, as well as look into the Duplicate Material tool. The aiShadowCatcher warning is a known issue. I guess it must be version-specific to 2018. It's just a warning, though, so it's not interfering with how MM5 works or updates the list. You can ignore it for now. I'll post an update when the next version comes out.